Outside the sports hall the local farmer and volunteers from LCP are about to unload 1.5 tons of potatoes. Inside, five people are weighing oranges and mandarins, cutting cheese into pieces and packing food into boxes. The fourth PTH charity event is about to begin with the objective being to provide food for some of the families in Pobiedna that were struggling in recent months. We greatly appreciate and acknowledge the contributions from our friends in Berlin who ensured that the event was a huge success. Together with the village spokesman and the priest, 28 families were considerately chosen for receiving this support. It was important to identify the criteria for selection and these families were selected on the basis that they all live on a small income in very difficult circumstances. In Pobiedna many people are unemployed especially during the winter season when it is difficult to find work. Moreover the living costs are higher in the harsh winters as the locals need to buy more heating supplies. Therefore gestures like this are necessary and most appreciated. Come the time of the event, the families waited eagerly outside the sports hall, while inside, the supply boxes had already been divided into three categories, based on the size of the family. The families were greeted by the Polish-speaking volunteers who guided them to the table where they could collect the packages allocated to them. As for the contents of the boxes, each was filled with several bottles of oil, cheese, margarine, broth, sugar, jam, fruit yoghurt and instant chocolate powder. 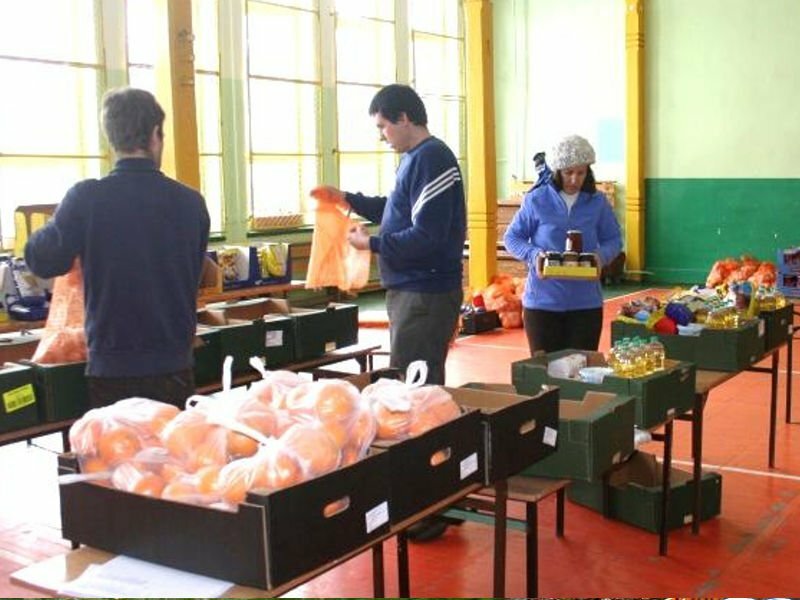 Also included was a variety of fresh produce including bags of mandarins, oranges and, of course, potatoes. It was heartwarming to hear so many kind words of gratitude from the recipients. The mandarins, fruit yoghurts and instant chocolate powder in particular made an impact on the children as was seen by the beaming smiles on their faces. As for us, the organizers from PTH, we were delighted to be able to arrange this event especially with the support shown through donations and the actions of volunteers. We look forward to continuing this good work in the future. It is thanks to these examples of support that locally the PTH is now a well-recognized, respected charity organization or, as recently expressed by a member of the local choir group, “the people who talk with the heart”.